How Long Does It Take to Know? “How long does it take to know, if the selected candidate will be successful in the role?” I asked. Marianna thought carefully, remembering those who had crashed and burned. “I get some early clues, but it depends on the role. Sometimes a week, sometimes a month,” she replied. “So, a higher level of work takes longer to confirm the selected candidate was the right one?” I pressed. “A higher level of work, high S-II or S-III, has longer time span goals. It takes longer to figure out if the selected candidate will be effective at longer time span goals,” Marianna said. This entry was posted in Hiring Talent and tagged hiring manager, hiring talent, probation period on October 17, 2016 by Tom Foster. “Some of guys get it and some of them don’t,” Germain explained. “What do you think the problem is?” I pressed. “It’s one of four things,” I said. Capability. Does the candidate have the capability necessary for the role? Skill. Does the candidate have the skill, were they trained in the skills necessary for the role? Do they continue to practice the skill? Interest or passion. Does the candidate have the interest or passion for the work? Do they place a high value on the work or a low value on the work? Required behaviors. Does the candidate engage in the required behaviors necessary for the work? Some behaviors, you contract for. Some behaviors are driven by habits. Some behaviors are driven by culture. “I’m not sure if I know,” he replied. This entry was posted in Accountability, Leadership and tagged accountability, hiring manager on September 21, 2016 by Tom Foster. What’s So Important That You Can’t Do This? I can’t do it. I just can’t do it. We are growing fast. I am the manager-once-removed with three managers that report to me. Between the three of them, they need to hire five people. You say that I should be the quarterback, that I am accountable for the quality of the hiring decisions made by my team of managers. I have more important things to do than to screen resumes and conduct interviews. I say that is their job. Perhaps you are right. You can’t do it. Maybe your role is overwhelming. Or maybe you think all that other work is more important. What more important thing do you have to do, than to build the infrastructure of your teams? Look, I know you are busy. And I know it seems like a lot to ask of you, to hire five people. So, let me pose this question. If you had to hire, not five, but fifty people, how would you do it? And I am not asking you to just open the flood gates, but make fifty effective hires, how would you do it? The answer is, you would enlist the help and support from your hiring managers, your HR department, your technical person, your culture person. You cannot do this alone, but you are still the quarterback. The central document in the hiring process is the role description. I don’t think you could write fifty role descriptions fast enough to keep up, so how would you do it? You would gather your team together and delegate out the pieces. You are still accountable for making sure quality role descriptions are written, but I would not expect you to personally do the writing. This entry was posted in Hiring Talent and tagged hiring manager, hiring talent, manager once removed on September 19, 2016 by Tom Foster. Most S-IV roles are integration roles, integrating systems and sub-systems for total organizational throughput. The tools at S-IV are system metrics. The role is typically an executive manager, VP or C-suite. Longest time span goals and objectives would be 2-3-4-5 years. Learning would be long-term (longitudinal) analytic. Highest level problem solving would include systems analysis (Senge-Fifth Discipline). Value-add to the organization is multi-system efficiency and total throughput. It is the role at S-IV to optimize multi-system output so that no one system overwhelms or drags on other systems, and to improve handoffs of work output from one system to the next system. One of the most important functions at S-IV is as the manager of S-III and the manager-once-removed (MOR) at S-II. Managerial roles at S-IV are accountable for the output of the team at S-III. The purpose of these next questions is to look at some of the systems in your prior company and examine the way those systems worked together? In your last role, list the functional systems that existed? What was your role title? Which single function were you most focused on? Looking at that system, what impact did other systems have on its output? Describe the balance or imbalance of your focus system and its surrounding system? When one system in your organization was out of balance, in your role, how did you discover the imbalance? When one system in your organization was out of balance, in your role, how did you influence or take direct action to correct the imbalance? How did you communicate the corrective steps necessary to re-balance the systems? How long did it take to re-balance the systems? How did you know, what metrics indicated the systems were back in balance? 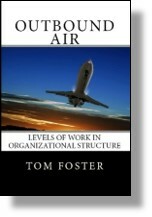 Step me through the work flow, start to finish as work moved from one function to another in your organization? As work moved from one function to the next, how was that work transferred, communicated, handed-off? Looking at the work transitions between functions, in your role, how did you detect problems? Looking at the work transitions between functions, in your role, how did you influence or take direct action to improve the hand-off transitions? How did you communicate the necessary steps to improve the hand-off transitions? How did you document the hand-off transition steps? How did you know when the hand-off transitions improved? Tell me about another example? This entry was posted in Hiring Talent, Time Span and tagged hiring manager, hiring talent, interview questions, s-IV on September 14, 2016 by Tom Foster.